What you'll find on this page: Friendly reminders on things you should be doing for your water heater. Check your water pressure once in awhile. It should be below 80 psi. Anything higher can stress the pipes and shorten the life of the water heater. Use a water pressure gauge like the one at right. This one is on the drain valve of our water heater, but you can use any hose bibb in the house. 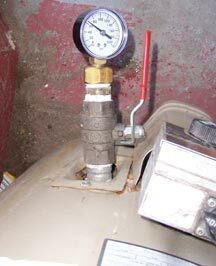 Test static pressure and then test for thermal expansion by making sure nobody is using hot water and turning up the water heater thermostat to make the heater fire up. If you see spikes, think about installing an expansion tank.